As of Monday night, I should say and subject to change!!!!! 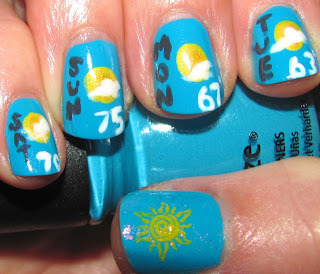 I mostly made this manicure as a reminder to me that there is the potential for 70 degrees on Saturday!!!! That would be crazy! 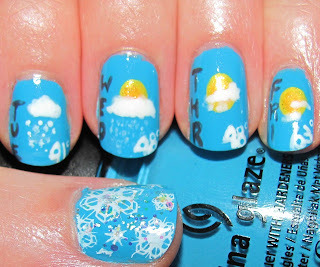 If you can't tell by my latest posts, weather has been my obsession as I exhaustedly wait for spring. I need flowers! I need to ride on my scooter! I need sun and surf (more like lakeshore)! ASAP! I painted a base of three coats of China Glaze Sunday Funday. For the other parts in the scene I used China Glaze Dandy Lying Around, White on White, Solar Power, Lighthouse, Orange You Hot? and Zoya Kelly. My Right thumb added snowflakes with Bundle Monster image disc BM323 using Konad Special Polish in White with China Glaze Snow Globe atop. My Right thumb added the sun image with Bundle Monster image disc BM01 using Konad Special Polish in Yellow and adding Essie Shine of the Times on top. One coat of Seche Vite was used to finish the look.